The Amazon ecosystem is a river world; its innumerable streams, tributaries and channels comprise a million miles of navigable waterway. But sometimes the navigation is not so easy! Nature conspires to make things difficult for boats and canoes because the quiet sluggish creeks offer ideal habitat for colonizing grasses. These float in the water and quickly choke up a stream. When the river drops the plants anchor themselves in the muddy river bed. As the river rises pieces break off and float away to colonize new areas. In this way the grass plant propagates itself all across Amazonia. These are the flowers of a type of grass (Paspalum sp.). 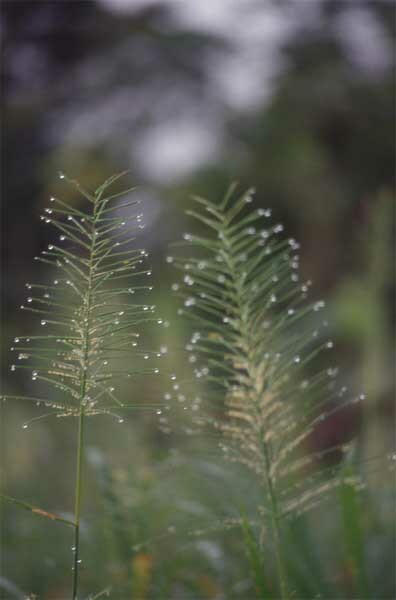 Unlike most rainforest plants, grasses are pollinated by wind, relying on it to carry their pollen between plants. Hence the flowers are built so that they will move at the slightest hint of a breeze. 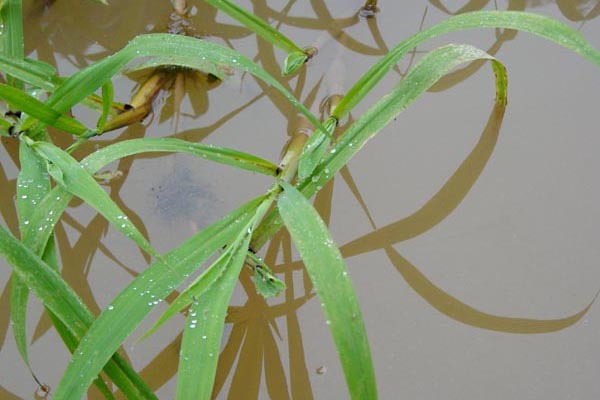 This grass grows floating in water (see photo below). This typical form shows the blades of the floating grass, a similar (or the same) species as shown above. Note the water droplets on the leaves. The brown color water is actually very clean and free of significant pollution as this area is far from any development. Notice the clump of roots just under the water surface.